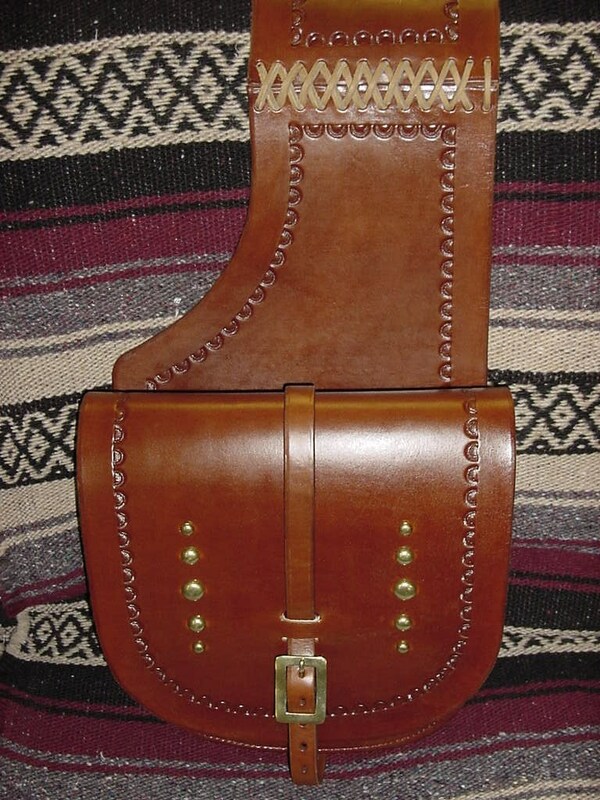 Chisholm’s Trail makes custom leather rifle scabbards & Western leather saddlebags. Your rifle never had it so good. Order a Chisholm’s Trail Leather rifle scabbards for your rifles now. 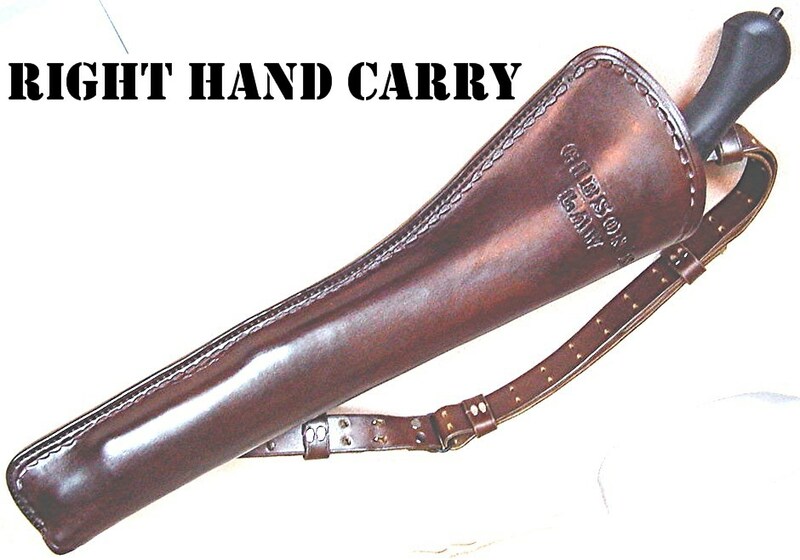 Leather rifle scabbards make it easy to attach your rifle to your saddle or around your shoulders and protects your fine rifle from the elements when you are outside riding or hiking. Give your expensive rifles the best: custom leather rifle scabbards from Chisholm’s Trail Leather. For a reasonable price, we’ll even stamp yours with your initials, if you like. Order your leather rifle scabbards now. Your hunting partners will ask where you got such a nice case for your rifle.. Note: We do not line rifle scabbards since they can get caught on the rear sights. 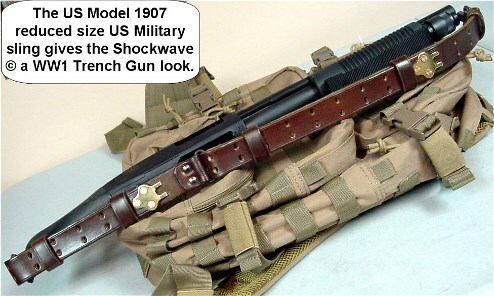 Testimonial from a satisfied customer: “Alan, this is David F. I received my Suede RS-2 rifle scabbard yesterday. The quality and craftsmanship are outstanding. I’m very happy with it. Nice to know there are still people like you and Donna that still take pride in their work product. It shows! Keep up the great work! I will be waiting to purchase another scabbard in the longer length for my Marlin 1895 Cowboy edition. Sincerely ~ David F.
1. Due to rising costs in supplies, materials & leather, prices have increased $10 per item. 3. No lining available for rifle scabbards. 4. We recommend ordering a set of saddle straps to secure the scabbard to your saddle, transportation, or wall display. A generous length is provided in heavy duty 9-10 gauge tooling leather with rectangular brass or nickel buckles standard or special order oval engraved buckles. 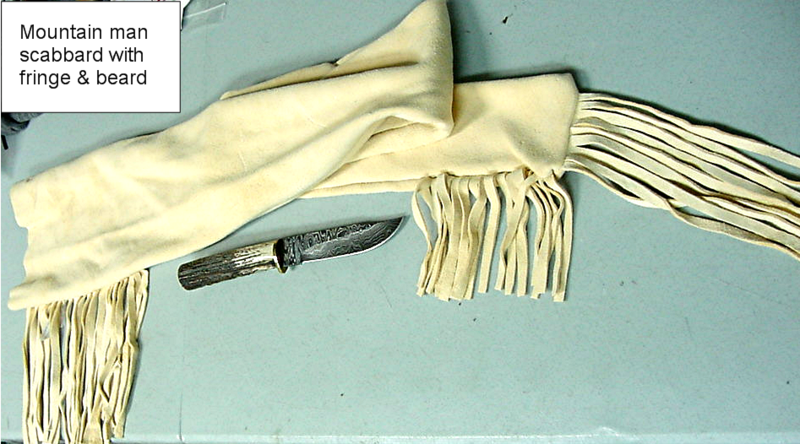 Old West Leather Cuffs – cowboy cuffs – holsters – gun belts in authentic Cowboy hero patterns – Spear point Bowie knife with knife sheath shown. 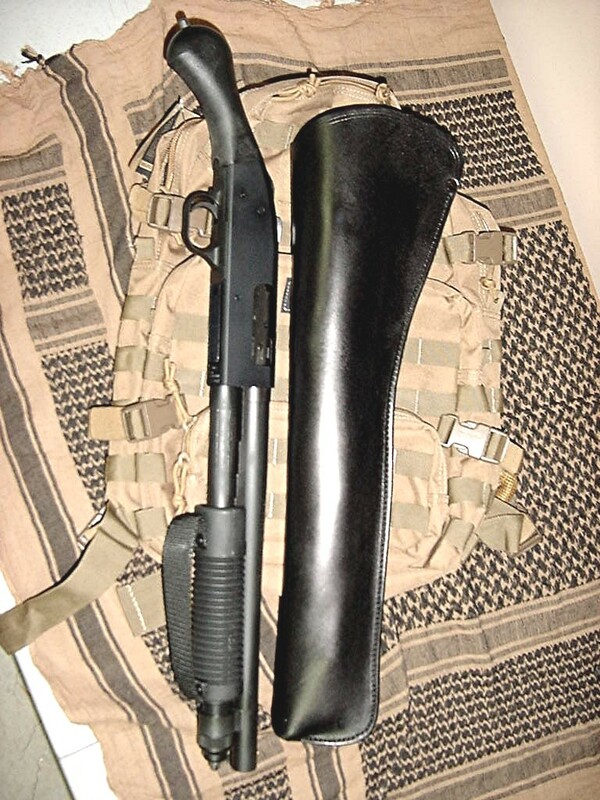 (The scabbard in black is for a left hand carry only) We have been impressed with the capabilities of the new Mossberg ® SHOCKWAVE tactical, 14″ barrel, 12 gauge. 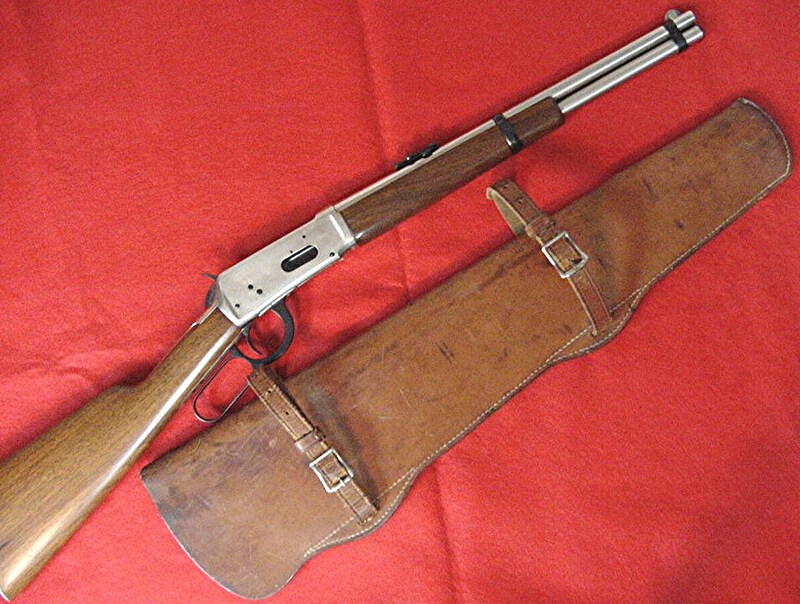 It is classed as a firearm – not a shotgun because it has been produced as it looks and never had a shoulder stock. Do NOT alter this firearm in anyway or you will void the ability to legally use this 12 gauge. Capacity is 5 shells with one more in the chamber. The forend slide release and safety are easily reached with the same hand while not altering your grip. If you are in bear country, back packing, traveling, or using it for home defense- this is the protection you need. We recommend Mossberg ® and this shotgun if you need one for any of these uses. 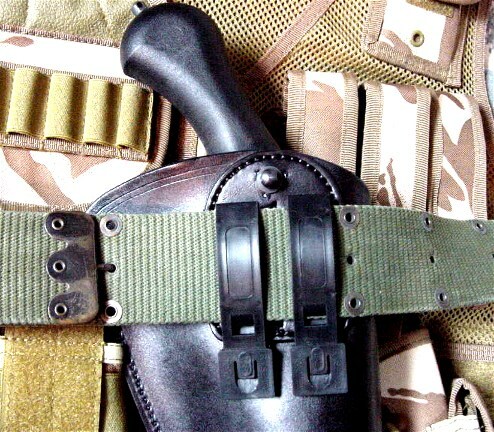 Adjustable shoulder strap, drop belt loop, bandolier strap, and waist belt all available at an additional cost. Call and design your own scabbard. Heavy duty and ready for rough use- get yours now. UPDATE: Personal experience in firing this 12 gauge with normal shells, until you get used to it, suggests that you wear strong leather gloves the first few times you shoot this firearm to insure the hand you grip the gun with does not ride up and strike the safety, resulting in injury to your palm. The majority of our accessories will also fit the new Remington Model 870 Tac- 14. 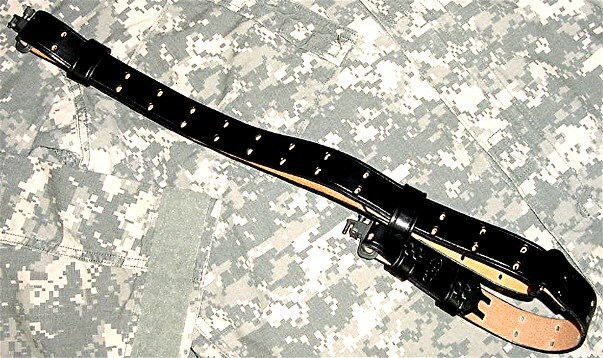 Decorative Drop Loop Strap- To set off the looks of the scabbard we occasionally are requested to put a strap around the shaft at about midway with a nickel buckle. With edge groove ~ $24.95. For edge stamp add $10. 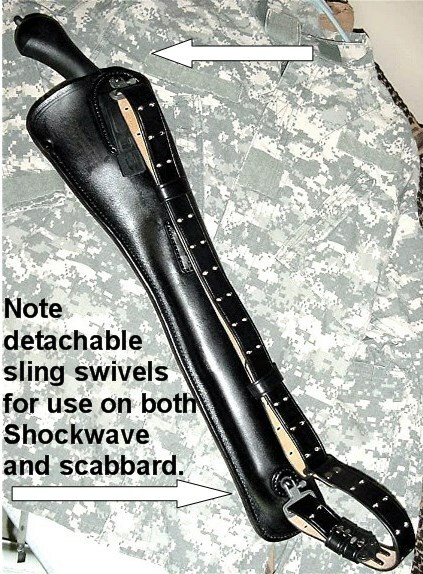 Detachable Bandolier Shoulder Strap- has attachments to secure to the top backside of the Shockwave scabbard. With edge groove ~ $174.95. Mil Spec 1 1/4″ Heavy Duty Detachable Sling Swivels- Don’t trust the foreign shoddy pot metal sling swivels available on line. Ours meet or exceed the U.S. military specifications, with the stamina an durability to survive extended tactical or survival use. Providing 500 pounds of pull strength, these detachable swivels are large enough to accommodate heavy leather military and law enforcement slings. Each one has a military phosphate coating to resist the elements. One set of two swivels with military black anodizing ~ $34.95. 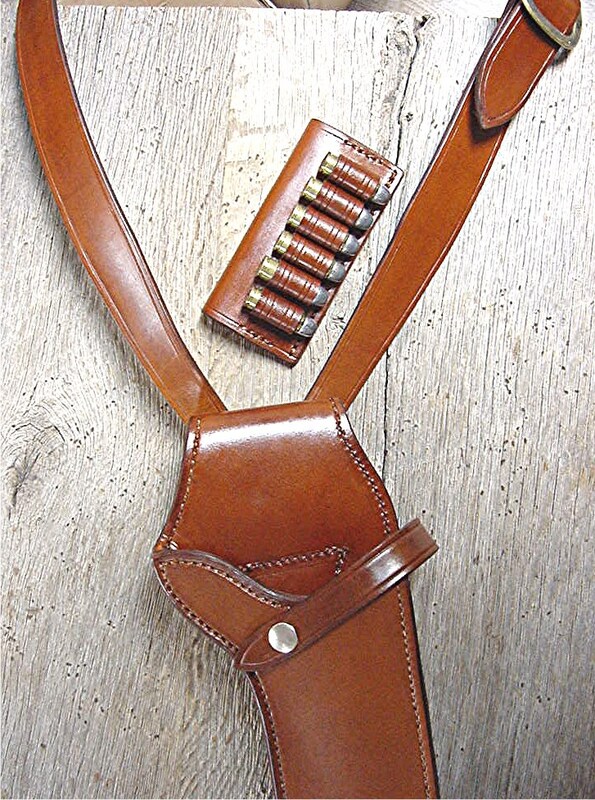 12 or 20 Gauge Belt Loop Slide- Holds six shotgun shells in a folded belt slide. Specify caliber and width of belt to fit. With edge groove ~ $49.95. Heavy duty rifle scabbards for the Winchester Henry, 1866, 73, 76, 86, 92 & 94. We also make cases for the modern Henry. $199.95 with edge groove. The 1876 and 1886 require a larger case and are $209.95. Addition of edge stamping on one side adds – $20.00. Two 36″ saddle straps with square brass or nickel buckles ~ $49.95. For antique engraved buckles add $10 each. Full hand basket weave or Sheridan carving adds $99.95 per side. The larger 1876 and 86 scabbards are $149.95 per side. We now make scabbards with slots for the saddle straps which are much more secure. Customer Comments: All I can say is WOW!!!! My wife gave me an RS-2 suede carbine scabbard for Christmas for my Henry .45 Colt Golden Boy. The scabbard exceeded all of my expectations and I am VERY satisfied with your product. Thanks for offering such quality merchandise. 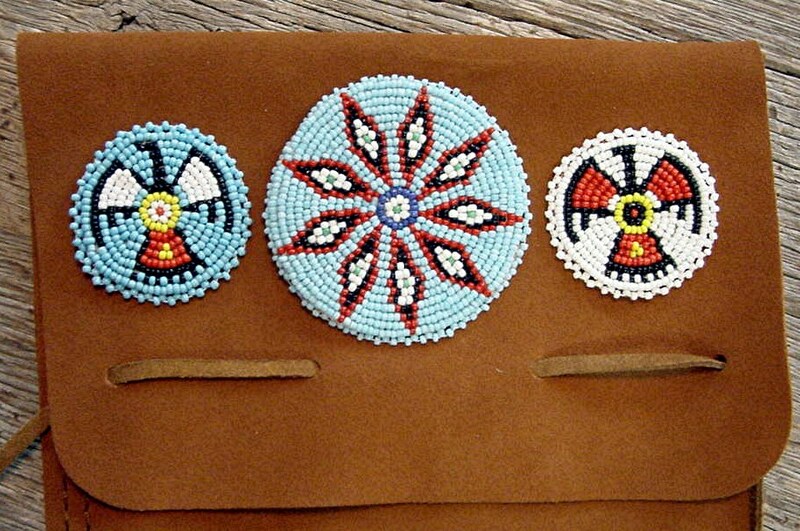 Sincerely, Tony C.
For a really outstanding suede scabbard and Southwestern look, add one or more 1 1/2″ or 2″ beaded rosettes on the flap for ~ $29.95 each. Add a 3″ Rosette for ~ $ 34.95. These are hand done and really nice. . (NOTE: We do not sew these on). You can apply up to 3 rosettes in a row as the photo depicts to the left. 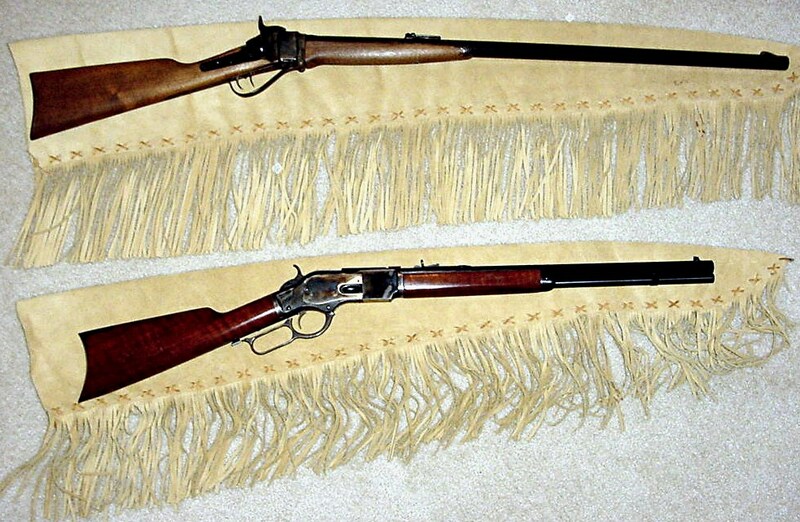 Although rosettes should be both glued and hand sewn on the rifle scabbard, they are not intended for hard use and there is a possibility they could come loose. They can be restitched on if necessary. 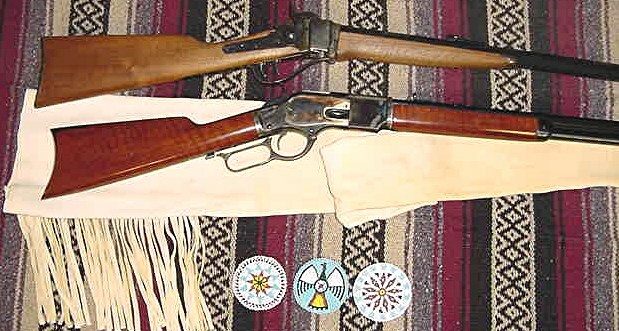 Indian replicas not made by Native Americans as defined by 2.5 USC & 305 ET SEQ. Our new Plains Indian scabbards are made from the highest quality grade American heavy weight, low nap suede. 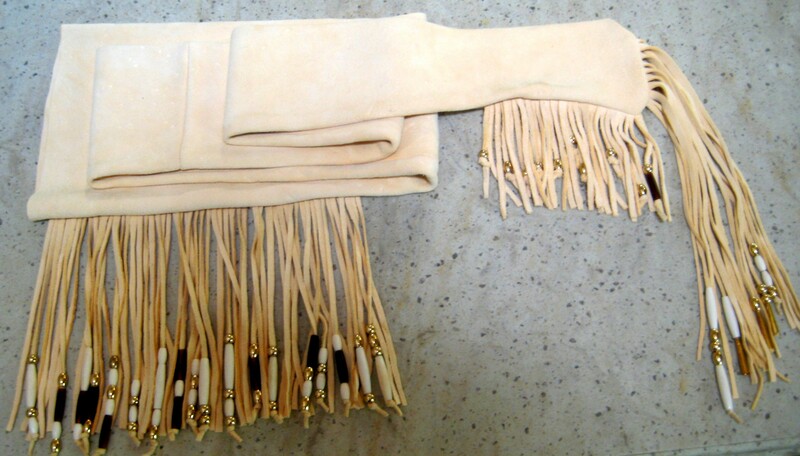 The full fringe is hand cut and the entire scabbard is hand laced. These hand made scabbards vary in length from 48″ to 53″ depending on the hide. Occasionally we can make them longer. As you can see from the photo a Sharps will fit in the longer one and a full size Winchester will fit in the shorter one. Reasonably priced at $199.95. Indian replicas not made by Native Americans as defined by 2.5 USC & 305 ET SEQ. Sized to fit the 18″ -20″ carbine. Also the 16″ Trapper available. Scabbard can be made to fit the large bow lever or normal lever. With edge groove only ~ $199.95. Addition of edge stamping adds – $20.00. These can be marked “J.W. 100″ to celebrate the 100th anniversary of his birthday will add $10.00. We highly recommend two 36” saddle straps with square brass or nickel buckles ~ $49.95. For antique engraved buckles add $10 each. One side full basket weave or Sheridan carving add ~ $99.95.. Finally a scabbard that will fit the Trapper length Winchester/Rossi Model 92 “Large Bow” lever action. ~ $199.95 with edge groove. Addition of edge stamping adds – $20.00. Don’t forget to add two 36″ saddle straps with square brass or nickel buckles ~ $49.95. For antique engraved buckles add $10 each. One side full basket weave or Sheridan carving add ~ $99.95. 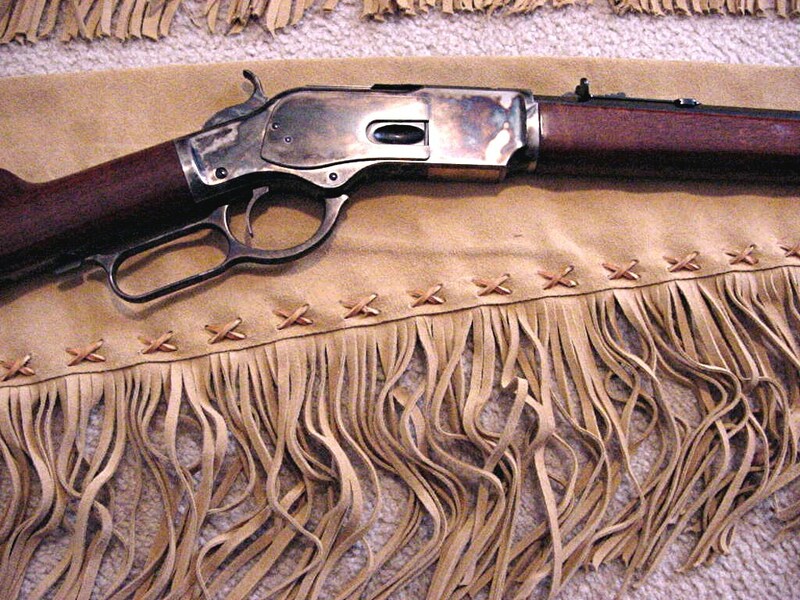 Modeled after Texas Ranger Joaquin Jackson’s Winchester 1894 “Trapper” short barrel saddle scabbard. 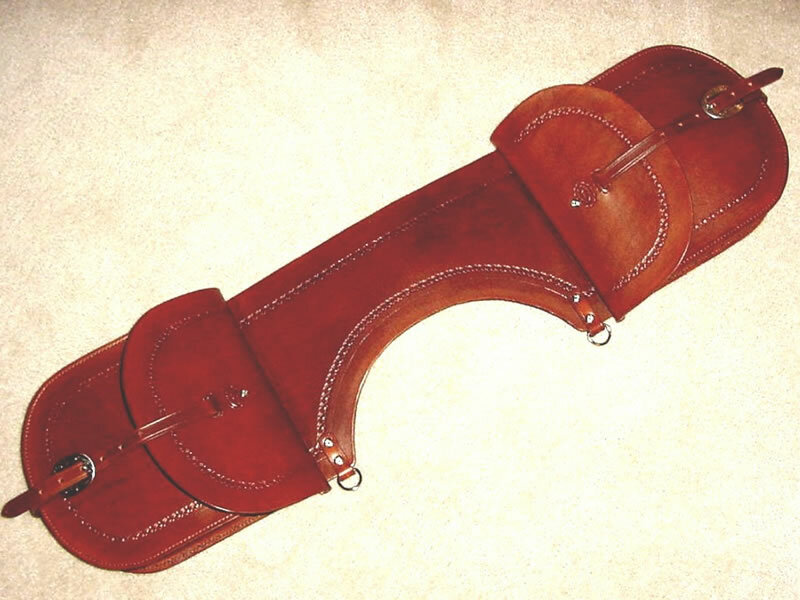 Many Rangers ordered a no nonsense tough rifle scabbard with “no frills or dressings.” Built for hard use in the saddle this scabbard has cut outs along the stitch line for the saddle straps. With no riveted loops this removed the problem of scratching your gun while taking it in and out. Scabbard ~ $199.95. Two 36″ saddle straps with square brass or nickel buckles ~ $49.95. For antique engraved buckles add $10 each. Addition of edge stamping adds – $20.00. One side full basket weave or Sheridan carving add ~ $99.95. As close as we could make to the original, including the laced on suede fringe and hand painted Indian designs. Edges are double stitched and interior is pebble grain leather to reduce moisture retention. Made from Australian prop master’s photos from the movie. Heavy duty quality ~ $299.95 Indian replicas not made by Native Americans as defined by 2.5 USC & 305 ET SEQ. 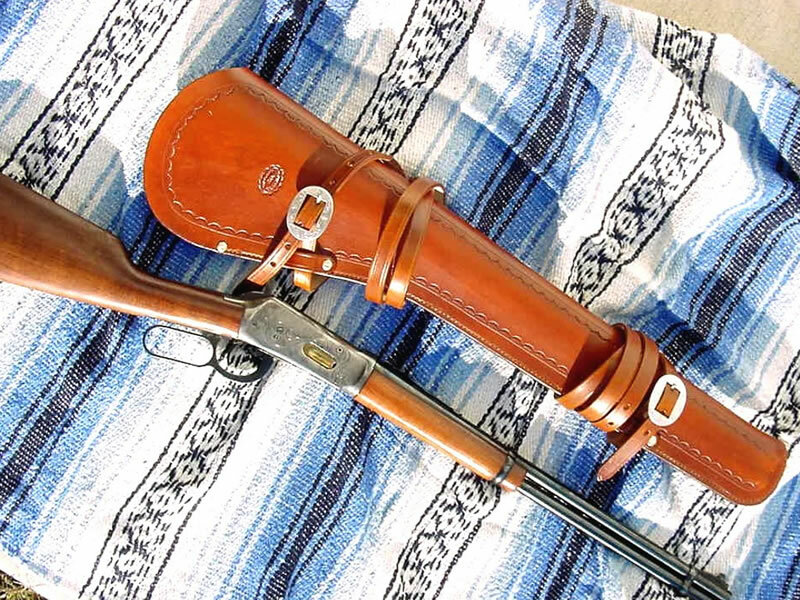 Made as a tribute to the 50th anniversary of the movie “Rio Bravo.” We have reproduced the “Big Loop” rifle scabbard with edge groove to fit “Dukes ” 20″ rifle he used in the movie ~ $199.95. Two 36″ saddle straps with square brass or nickel buckles ~ $49.95. For antique engraved buckles add $10 each. Addition of edge stamping adds – $20.00. One side full basket weave or Sheridan carving add ~ $99.95. *This rifle can also be ordered NOW from Bryan Buck of 3B Shooting Supply (214) 801-4476. 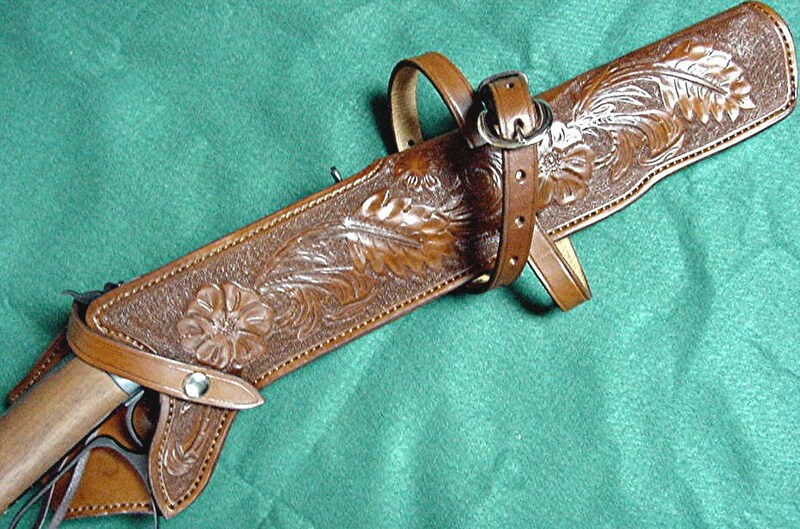 Chisholm’s trail leather rifle scabbards protect your rifle. Short scabbard will fit both lever action trapper carbines and the short lever action Winchester shotgun With edge groove only ~ $199.95. Addition of edge stamping adds – $20.00. Full tooled flowers & vines or basket weave ~ $349.95. Two 36″ saddle straps with square brass or nickel buckles ~ $49.95. For antique engraved buckles add $10 each. 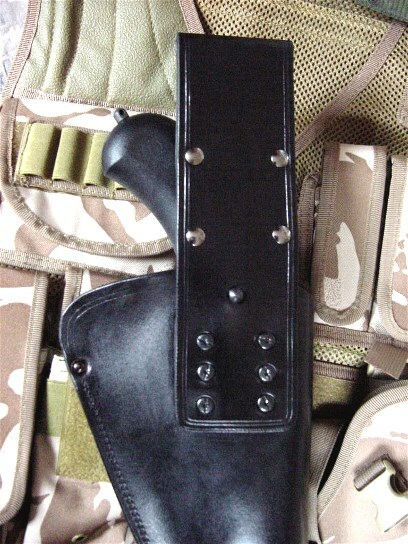 (Photo Pending) A low drop holster with three loops across the front. 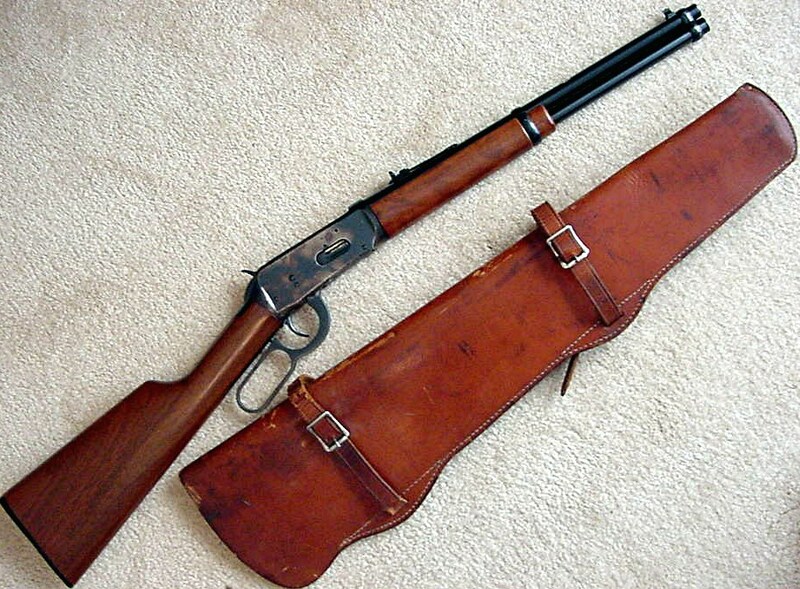 Great way to carry that short cut off Winchester Model 92. Can be made plain or fancy. Fits like a holster but cut lower on the front (sight) side. This short Winchester Model 1892 style gun is difficult to draw, so the lower front cut allows quicker access to the gun. Can be made for the 9″ barrel Chiappa, or the longer 12″ barrel Rossi Ranch Hand. Special Features: Scabbard lining is included. Removable safety snap strap is included. Leg strap and buckle are included. Enhanced Features: For a six (6) loop cartridge slide to fit the leg or shoulder strap add $49.95. For a 1 1/2″ strap and attachments secured to the reverse side to wear over your shoulder, as well as on a belt add $69.95. The standard scabbard without decoration is $274.95, includes only standard features listed above. One side full basket weave or Sheridan carving add ~ $99.95. This is the most secure and easily accessible way to carry your cut down Winchester Model 1892, Rossi Ranch Hand or clone. Matching gun belt is available (P.O.R). Good roomy size smaller bag with 3 ‘ gusset and edge groove, or one row of stamping on both flaps. As shown with edge stamping on all top surfaces $299.95. Addition of edge stamping adds – $20.00. Input is required as to curve of the back of your saddle and length between bags. Fancy buckles add $10 each. tags for social media: leather rifle scabbards, western leather belts, gunbelts.